Solar Pool Heaters With Panels Of Different Sizes - Complex Plumbing! Solar pool heater plumbing is complex enough, but what happens when you have panels of different sizes? The pipe plumbing on the roof can become quite complicated, adding a lot of pipe to the job. The single most important factor is ensuring that there is a “common high point.” The array of panels is fed and returned from opposite ends of the array. All panels must have plumbing that reaches the highest point along the return line. The return line is at the top of the solar panels. The common high point means when you have panels of different sizes or panels installed at different elevations, there can be a LOT of plumbing! Take this solar pool heater pictured below. It is a pretty common scenario. This system not only has panels of different lengths, but one roof has a lower return line than the others. This required achieving a common high point by going up the roof before coming back down. Because of the pump location there are places where the plumbing had to jump over other pipes. 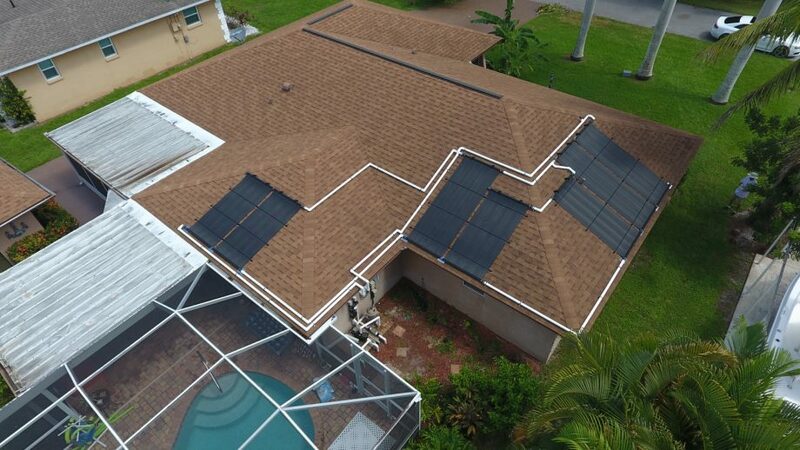 This aerial view shows lots of PVC pipe on the roof to achieve proper flow through all of the panels. Achieving a common high point in the roof plumbing often has many solutions, none of which are easy. From the sky this looks like a mess. From the ground you can’t tell that there is so much plumbing. Most of it is tucked away behind the panels. All of this extra pipe isn’t cheap. It’s not the pipe itself or the fittings. It’s all of the stainless steel clamps, spacers, sealant, and labor to put it all together. While this doesn’t add dramatically to the price of an installation, there is some cost that we have to pass along. Of course, it’s best to avoid it altogether, but on some roofs there just isn’t any other option. We love challenging jobs. Doing it right takes know-how and patience. Taking on work that nobody else wants is something we deal with frequently – with a smile. And as crazy as this spaghetti factory of plumbing looks, it definitely makes us smile! Ideally we use panels all the same length. 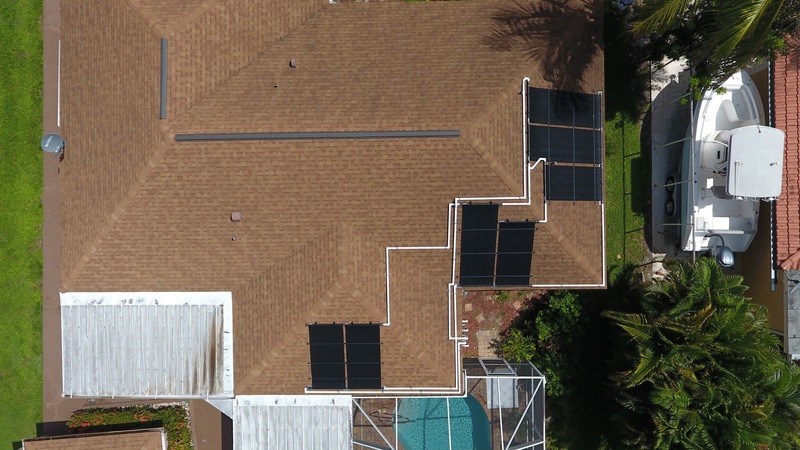 On many hip roofs, there simply isn’t enough space to get enough solar panel coverage to heat a pool properly with a single panel size. When there are many hips and valleys the individual roof surfaces become smaller. Roofs become rhombuses, trapezoids, and triangles. (Sorry for the geometry lesson). It is pretty uncommon to find a roof too complex or too small to install a solar pool heater. We turn away about 1 out of 20 people who just don’t have suitable space for a solar pool heater. When it is on the edge we often need solar pool heating panels of different sizes, and that makes things pretty complex.